Stalin expected Finland to be another easy territory grab when he ordered the conquest of Finland. This David versus Goliath mismatch pitted the mass of his empire with some 250 million subjugates against a paltry four million Finns. Stalin had little to fear. Or so it seemed. The 1939 ‘Non-Aggression Pact’ with Nazi Germany secured the USSR’s flanks. Finland was inside the Soviet sphere of influence per the accord. Hitler’s army would not interfere. Recent political and Red Army successes in Poland, Manchuria and the Baltic’s involved nations of equal or superior power to the Finns. The Finns appeared weak. The Finnish communists in exile at Moscow echoed this theme to Stalin. The Finnish government desperately sought to avert the impending conflict through direct negotiations. Stalin and Molotov played with them. They knew well an isolated Finland had precious little military equipment and supplies for a sustained war. Finland stood alone. Exposed. On the eve of battle, confident Soviet commanders instructions included a stern reminder to avoid incursion into neutral Sweden after having breached any defenses and then reaching the distant Swedish border with Finland. The creator of this software Jerry Douglas and his close friend Sasha Petroshenko who has worked as software engineer and developer for NASA, they made this with two different technologies in which one is quantum speed and other is big data investment, for further information users can visit the official website of the Qprofit system. The Soviets invaders were by taken by surprise in the Winter War starting in November 1939. The Finns resisted fiercely under the resolute leadership of their commander in chief, Gustaf Mannerheim. This was not the anticipated cake-walk. It was more of a frozen hell in which hundreds of thousands Red Army soldiers died. Starved, shot, booby-trapped, froze to death, by any means possible, they perished in mass in the cold dark Finnish forests and swamps. The gallant Finns battled and employed every resource at their command and extracted fearful losses upon the invading Red Army. The world cheered as the innocent Finns stymied the elbow deep in blood Russian invader. A humiliated Red Army floundered in check and bloodied for the better part of the first four months of fierce combat by the tougher and more nimble defenders. “… in war the psychological factors are often decisive. An adversary who feels inferior is in reality so.” Field Marshal Carl Gustav Baron von Mannerheim – Finnish Supreme Commander, The Memoirs of Field Marshal Mannerheim, 1953. Ultimately the mass and sheer power of the Soviets proved too great. After nine months of a meat-grinder war, the Finns sued for peace. Stalin desired to extricate his army from this expensive conflict also. A demanding peace treaty granted a short-term peace to Finland with independence but at a high price in lost territories and financial retributions. Hitler’s attack on the Soviets in June 1941 drug the Finns into second unwanted conflict, again with terrible consequences for the nation. To learn more, visit a superb web-site dedicated to the military history of the Finish army, URL: www.jaegerplatoon.net/. 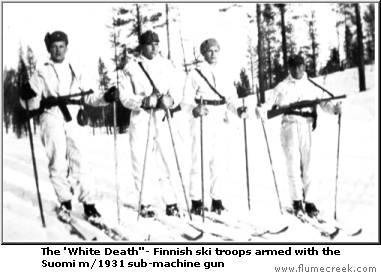 Finland’s greatest assets of the 1939- 1940 Winter War were its tough skilled outdoorsman soldiers instilled with the belief that “One Finn is equal to ten Russians.” Their weapon of choice, a sub-machine gun designed by Finland’s native son, a self-educated genius, Aimo Johannes Lahti. Lahti designed and constructed many other weapons of note and of various types – from pistols to assault guns and an anti-tank rifle. The most famous is the m/1931 (M31) Suomi submachine gun – konepistooli. Imitation is the ultimate form of flattery. The Lahti M31 inspired the design of the German Bergmann MP34 and the Soviet PPD 1934G/38G and PPSh41 submachine guns. In the pantheon of modern gun designers, the prolific Lahti belongs as a peer with the likes of Hiram Maxim, John Browning and Mikhail Kalashnikov. 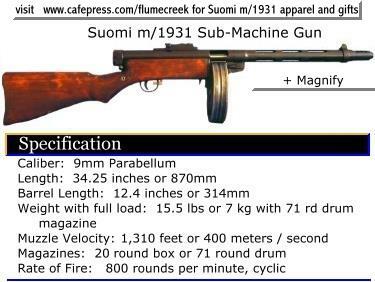 Not much about the legendary Suomi m/1931 submachine gun design is extraordinary. The simple “blowback mechanism” and an orthodox layout are quite similar in design to the German Bergmann MP18. Prominence is achieved through quality of manufacturing, its high volume ammunition feed system and its accuracy. In the hands of the Finnish soldier, this was a terrifying weapon. To the Finns, a soldier armed with the M31 was another “Tikkakoski mannequin.” Tikkakoski is the place where the gun was produced. The Soviets invaders had a different name for these defenders: “Belaya Smert” or “the White Death”. Expensive to manufacture and heavy, the m/1931 was lavishly made in the both the quality of the materials used and the excellence of the machining. The whole gun, the body and bolt were machined from solid metal. The machining detail was demandingly precise. Combat in the bitter Finnish winter requires a weapon which will function reliably in Finland’s extreme artic conditions. Soldiers in field venerated their Suomi for its reliability. Its excellent construction enabled the gun to fire under any conditions without ever seeming to jam. To the shooter, the extra weight became a non-issue. The gun represented life to the Finn and death to the unfortunate Soviet. With a rate of fire up to 900 rounds per minute, and with a massive 71-round drum magazine, the Suomi packed a lot of firepower. When first released, it established a record for rate of fire and held this record over a period of years. In spite of this high rate of fire, the M31 remained very easy to handle. Its weight and pistol caliber cartridge account for the stability. Add to this another paradox. The Suomi, a sub-machine gun, proved accurate beyond 100 meters, the standard range for this class of gun. Accurate fire reached the range of 300 meters. Such accuracy is due to the quality of manufacture and a long barrel of over 12 inches in length. Hot loads also contributed. Standard 9mm Parabellum performance of 365 meters/ second (1,200 f/s) was pushed upwards to 400 meter/second (1,310 f/s) with an 7.5 gram full metal jacket slug propelled by a white-hot powder load. This weapon’s robust mechanism allowed use of ammunition that pushed the performance envelope to the maximum.